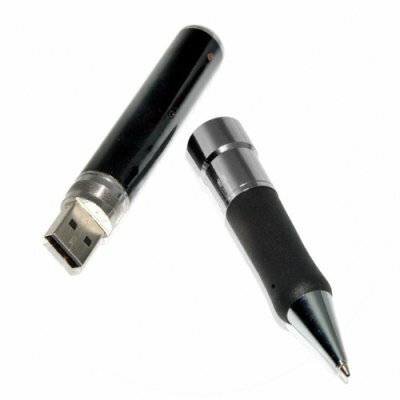 Successfully Added Surveillance Style Pen Camcorder - 2GB USB Flash Drive to your Shopping Cart. Get the mission completed with with this awesome secret agent type pen camcorder. Sitting in your shirt pocket, standing in the pen cup or lying on the desk, nobody will ever notice as you capture their every move. The built in flash stores the video until it is ready to be downloaded to a computer via USB, and with 2GB of memory you'll get over 5 hours of recording time. The video is encoded on the fly through a buffer system to MPEG 4, allowing quick transfer and viewing on a computer or LCD with USB input. All video is captured with audio making this the perfect tool for recording interviews, meetings, important conversations, or secret rendezvous. The pen itself is an attractive writing instrument with a gloss black finish on the main body, rubber finger grip and chrome detailing. Buy today at Chinavasions excellent wholesale prices and use our drop shipping service to get it straight to your customers doors quickly with no hassle. cameras with audio may not be permitted in certain countries, please check with your local customs when importing..